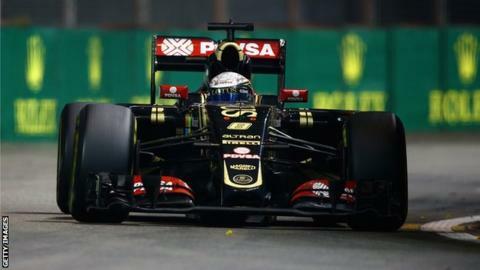 Lotus driver Romain Grosjean is poised to move to the new US-based Haas team next season. Sources close to the Franco-Swiss say Grosjean has already made his mind up to switch despite the expected impending takeover of Lotus by Renault. His switch would leave a vacancy at Lotus/Renault alongside Pastor Maldonado, whose new deal was announced on Sunday. Contenders for the seat include ex-Toro Rosso driver Jean-Eric Vergne. And McLaren reserve Kevin Magnussen is also in the running. Magnussen, who raced in F1 for McLaren last season, could be drafted in again if Jenson Button decides to retire at the end of the year. Force India driver Sergio Perez has also been mentioned in connection with a switch to Renault despite the fact that the Mexican and his current team say it is only a matter of time before he is confirmed alongside team-mate Nico Hulkenberg for 2016. Renault Sport boss Cyril Abiteboul dropped a heavy hint on Sunday night after the Singapore Grand Prix that the French car giant had not been able to secure Grosjean's signature. Abiteboul told French television station Canal Plus: "It's a shame we couldn't talk about it, but we maybe were not ready in time. It's all about timing. "Romain is a great driver, he deserves a great team. There's no national bias, we wouldn't stay in Formula 1 for a particular country or region. "Renault is an international brand, especially in countries like China and in south-east Asia. But we're on a project which necessarily needs a little French touch. There are young Frenchmen pushing, so I'm not worried." It is an unusual move to leave an established team with a successful history for a start-up, but Grosjean hopes moving to Haas will give him a strong chance of taking Kimi Raikkonen's seat at Ferrari in 2017. Haas have close links with Ferrari and Raikkonen is out of contract at the end of next year. Haas have stated that either Gutierrez or Ferrari development driver Vergne will get one of the seats, in deference to their Ferrari links. The new team are buying as many parts from Ferrari for their new car as is allowed under the regulations, doing only the chassis and aerodynamic surfaces themselves.